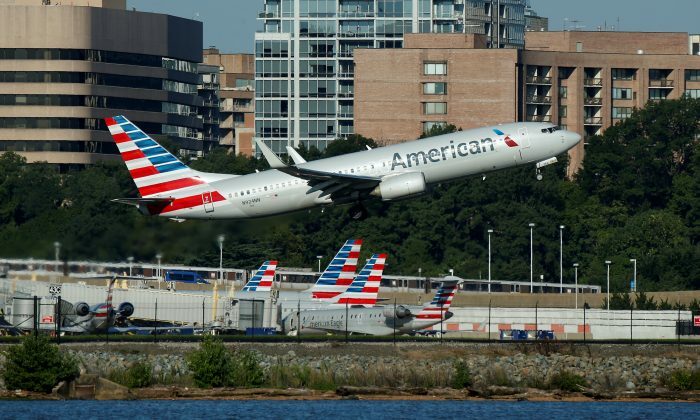 American Airlines Group Inc. on April 9 trimmed its first-quarter revenue forecast after canceling more than 2,000 flights due to the global grounding of Boeing 737 MAX jets and problems with overhead bins in cabins of another Boeing jet that the airline was retrofitting. American said it was too early to project the total cost of the suspended operations of the 737 MAX in the wake of two deadly crashes. The No. 1 U.S. carrier owns 24 of the brand-new Boeing Co aircraft whose use was suspended around the world in March. The MAX grounding caused 1,200 American flight cancellations during the first quarter, in addition to 940 cancellations due to American’s decision to remove 14 737-800 aircraft from service after pilots complained that overhead bins were not closing on some recently retrofitted cabins. As a result, American said it now expects revenue per available seat mile, a closely followed measure of performance, to be flat to up 1 percent compared with the prior forecast of flat to 2 percent growth. American said all its 737-800 aircraft will be back in service by the end of April, but the carrier will continue to cancel about 90 flights per day through June 5 as the 737 MAX remains grounded. Because it is still unclear when the MAX jets will begin flying again, American said it cannot yet forecast the cost of the disruption beyond the first quarter. Shares in American, which have risen about 5.5 percent so far this year, were down 2.1 percent at $33.175 in midday trading, off a session low of $32.60. American cut its first-quarter outlook for margins, citing higher fuel prices. Excluding special items, the company now expects pre-tax margin to be about 2 percent to 4 percent, compared with its prior forecast of 2.5 percent to 4.5 percent. Yet analysts said they were encouraged by the carrier’s passenger revenue performance considering the quarter’s headwinds, which also included the longest-ever U.S. government shutdown. Smaller rival Southwest Airlines Co. was the first U.S. airline to formally cut its financial outlook for the year after being forced to pull its new fleet of 34 Boeing 737 MAX planes out of service. United Airlines, which owns 14 MAX but has managed to avoid cancellations by using larger aircraft on those routes, said on April 9 the strategy was costing it money and could not continue forever.